Investigated and set up by Boris v. Skadowsky according to historical and archives' documents. Webdesigh by: Dr. Viktor Prieb - Descendant of Maria Friederike Stark, girl's name Möllmann (Mehlmann), und of Sophie Prieb, girl's name Stark. With the documentation of the true history of the first Fein in Russia. Four generations of our ancestors in Russia, with portraits and a short text. Hereby I present the data for the fifth generation of the descendents of Johann Georg Fein for the first time. This version takes into consideration my latest findings regarding the history of the first Fein, who was a completely different person than had been previously reported! Documents which I found when researching in archives in Odessa and Cherson in the last few years made me question the validity of the prevailing version of the history of the first Fein in Russia. In my efforts to support the work of Ms. Anita Maaß on her book about the Falz-Feins 1, I concentrated in 2002/03 intensively on the history of Tauria (Crimea). This provides a background for the evaluation of the "sociocultural development and integration" of this family of German colonists. Thereby I noticed - and am seemingly the first to have done so - a grave incompatibility between the previously published histories of the Feins in Russia and the history of Tauria. The first Fein (supposedly Johann Melchior from Württemberg) was previously reported to have settled in "Molotschna near Melitopol/Tauria" in 1763 This was not possible because the Russian "Gouvernement Tauria" was founded in 1802, after the conquest of the area by Catherine II in 1783. This prompted me to intensify my research. In 1763, the supposed year of Johann Melchior Fein's settlement in Molotschna near Melitopol/Tauria, Tauria itself did not yet exist! The area was an unsettled steppe in the hands of the Turkish Ottoman Empire. Clearly Johann Melchior could not have settled in Molotschna/Tauria in 1763. This also eliminates the possibility that Johann Melchior Fein, born in Cleebronn/Württemberg in 1740, was the founder of the Fein/Falz-Fein family in Russia. He actually had only been chosen because his birth in 1740 fit plausibly to the presumed date of settlement of 1763. Thus Johann Melchior was neither the first Fein in Russia nor the founder of the family. He was also NOT the person from the story in Woldemar von Falz-Fein's book "Askania-Nova"2 who supposedly attacked an officer! He could also not have accepted the invitation of Catherine II in 1763 to travel to St. Petersburg and then to settle in Molotschna/Tauria, as was alleged. Catherine II invited the Germans to settle in Russia, not in what was in 1763 still Turkish-Osman territory. Nothing that has been previously written about him and the beginnings of the Falz-Fein history has anything to do with true story of the Falz-Feins in Russia! All family trees containing Johann Melchior are therefore incorrect. It was the textile machine engineer Johann Georg Fein from Saxony, born in Erfurt in 1773, who in 1807 went with his family to Ekaterinoslav/Russia to build textile factories. It was he who bought the plot of land nr. 104 (3470 Desjatin) in the colony Molotschna/Tauria in 1810, where he settled as a free colonist in 1814. Thus 50 years later than previously claimed the first Fein settled in Tauria and became the earliest ancestor in Russia of the Falz-Fein family. Until now all authors in the "East" and in the "West" who have concerned themselves with the history of the Falz-Feins have uncritically accepted the contents of the previous publications. These were based upon the book by Woldemar von Falz-Fein "Askania Nova"3 in which he refers to a story told by his mother of a soldier Fein from Württemberg who supposedly stabbed an officer with a bayonet during an altercation. This soldier allegedly deserted and then settled in Molotschna/Tauria in 1763. Woldemar expressly accompanied this story with the statement: "I cannot confirm that all of this really happened in this way." Nevertheless 30 years later the author Ms. L. Heiss, Stuttgart, in her novel for young readers "Paradise on the Steppe" about Askania-Nova and the Falz-Fein family assumed that the story was true without heeding Woldemar's caveat. In church records she found a Württemberger, Johann Melchior Fein from Cleebronn whose birth year of 1740 could plausibly fit to the year (1763) of assumed settlement in Molotschna/Tauria. As this man was a soldier, the fight with the officer also seemed to fit. She therefore fictionalized the story and presented him in her book as the first Fein in Russia! By appending an (incomplete) family tree of the Falz-Feins to her novel, she evoked an impression of historical authenticity. (This book has been published in German, English and French.) This was the origin of the erroneous version of the family history. Our ancestor Friedrich Fein was the eldest son of this Johann Georg Fein and NOT "the youngest son of Johann Melchior Fein", (who supposedly almost murdered an officer) and thus could not have inherited his "explosive character". He would also not have been ?chased out of the house with a shotgun by his father?. In fact, he came to Russia in 1807 with his father Johann Georg and was still working together with him in 1817 on the mechanisation of textile factories in Tauria. Thus he had been born in Chemnitz/Saxony in 1794 and not in Molotschna. Friedrich Fein later became known as the "king of the sheep breeders", the founder of the family fortune, the founder of the Falz-Fein dynasty and the most outstanding character in a family that produced many important personages. I was able to establish the early history of the Falz-Fein family in Russia just in time. I enabled Ms. Anita Maaß to incorporate the new, corrected version into her manuscript before it was published. Johann Melchior Fein from Württemberg is not our founding father and thus the Fein family in Württemberg, as well as our very prominent Falz-Fein family, is spared the blemish of having had a family member (or even a founding father) to whom the "horror story" of this soldier Fein was attributed. The family tree diagram "2007" (representing five generations) presented here is the final, definitive result of many years of work after emigrating to Germany as well as the results of my research after the changes in the Soviet Union. This family tree diagram is finally one which historians and authors can rely upon. It also offers the necessary historical and documentary background for historical novels. When Ms. Heiss wrote the novel "A Paradise in the Steppe" about the Falz-Fein family, she also based her story on the writings of W. Falz-Fein and found a Fein born in 1740 who fit the tale of Woldemar Falz-Fein in the church records of Cleebronn/Württemberg. Trusting the tale of Woldemar Falz-Fein, we erroneously accepted Johan Melchior Fein, whom Ms. Heiss had found, as our founding father. Baron von Falz-Fein, by sponsoring several publications (unfortunately still with the old version of the family history) was able to keep interest in the family achievements alive. The memoirs of the Falz-Fein family by A. E. Falz-Fein, 1911, are additional proof of the authenticity of the history of the Falz-Fein family in Russia as stated here. This can be used for future publication. Ms. Anita Maaß investigated church records and other archives in Saxony to collect data on the Fein family. Additional evidence supporting the new version of the family tree, particularly concerning the Falz family, was provided by Dr. Volkmar Richter of Dresden, who is a descendant of the Falz family in Saxony. Ms. N. Dragobytsch, who is a researcher at the Ukrainian nature preserve "Askania-Nova" (which now bears the name of its founder, Friedrich Falz-Fein), provided additional information about the history of the Falz-Fein family. Mrs. Maria and Dr. Viktor Prieb of Berlin (descendants of the Mehlmann family of Prischib/Tauria) provided invaluable help in the preparation of the family tree diagram with its texts and portraits, as well as the Russian version thereof. The English translation was provided by Mrs. Andrea Gruhn- v. Schlippe of Berlin (descendent of Rosalie v. Schlippe, born Falz-Fein). 3 Written in Berlin in the 1920's in exile. Published by Neumann-Neudamm, Leipzig, 1930. 4 Document of Boris v. Skadowsky from the archives in Odessa. 5 At the initiative of Dr. Volkmar Richter, the University of Dresden commissioned the historian Ms. Anita Maaß to write a history of the Falz-Fein family in southern Russia. 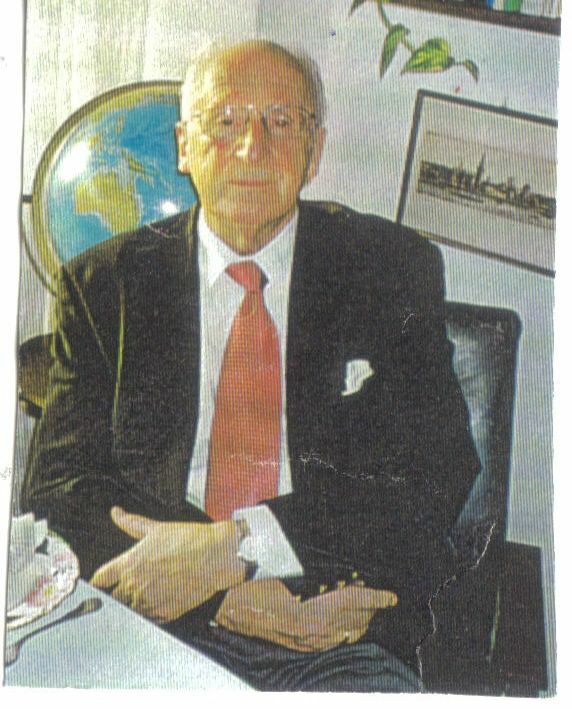 Boris v. Skadowsky, Berlin, Falz-Fein descendant (on both his mother's and father's sides) and genealogist made his comprehensive personal knowledge and documentation concerning the family history available for this work. Based on her research and on the new Falz-Fein family tree 2003/B2004 from Boris v. Skadowsky her book, "Man glaubt, in einem Märchenlande zu sein" thus became the first complete and reliable publication on the history of the Falz-Feins in Russia. Maaß, Anita: "Man glaubt, in einem Märchenlande zu sein. Zum ökonomischen Aufstieg und zur soziokulturellen Integration der sächsischen Familie Falz-Fein in Russland 1807-1914". 2004 w.e.b. Universitätsverlag & Buchhandel. Eckhard Richter & Co. OHG Bergstr. 78 D-11069 Dresden.